Well, i got the flyer from Brunei (via Facebook). It's info about the gig on Saturday, 23rd. 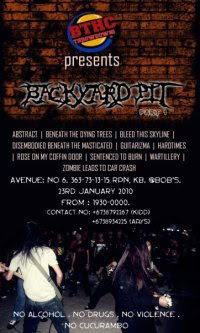 This is the first gig flyer i received from Brunei actually.. serious.. almost 20 years listening to this kind of stuff.. Get my self into the underworld for 15 years. It's before the myspace that creates MGB (Myspace Gay Band) because some of the bands nowadays only knows how to promote their band via myspace.